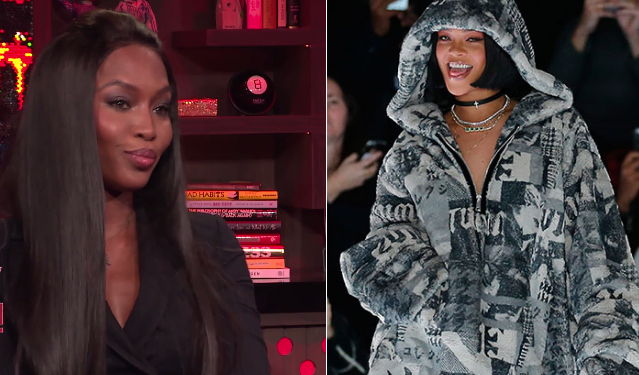 GossipWeLove | Pop Culture and Entertainment News Site: Naomi Campbell vs. Rihanna.... What Started the Beef? Back in March, Campbell appeared on Andy Cohen's "Watch What Happens Live" and cleared up any rumor that claimed she had a beef with the 29-year-old pop Princess, by saying she "had no problem with [Rihanna] and we've always been a notable public supporter of each other." "Everything's fine," Campbell smiled coyly, as if we were meant to think otherwise. "Of course it's fine... I'm an actress now, Andy," she cackled. Cohen replied, "I'm trying to think what the beef could be about." Then the 46-year-old got real about any purported tiff with RiRi. "I don't have beef," she clarified. "I don't have beef, especially with Black women that I think are powerful. And out there we're all in the same thing. [We're in] the same struggle."